​A couple of years ago, we looked at NASA’s StarDust Mission to investigate what Comet Wild2 was made of, paying particular attention to the rocky components of the comet and the surprising new perspective they give us on the development of the early history of our Solar System. What StarDust found was very puzzling : the comet contains dust from the inner Solar System, associated with ice from the outer Solar System, suggesting that the accretionary disk - that the Solar System had formed from - had undergone some kind of mechanical mixing very early in its history. This created a major headache for planetary scientists who have been looking for a mechanism that would allow this to happen. However, recent work published in the prestigious scientific journal Nature has come up with a possible solution. ​Let’s start by reminding ourselves of why the StarDust results were so problematic in the first place. The Solar System formed ~4.6 billion years ago by the condensation of a central star and the accretion of its attendant planets from the Solar Nebula, a rotating accretionary disk of gas and dust. The Solar Nebula had a marked thermal gradient - with cold outer reaches beyond the planets – which is where what we know comets formed. The important point to retain here is that comets are considered to contain ice and dust representative of the early Solar Nebula : they are “dirty snow-balls”. The question is : “Where did that dust come from ?”, and to answer that question we need to know what kind of dust occurs in comets. What did StarDust find when it looked at comet Wild2 ?. 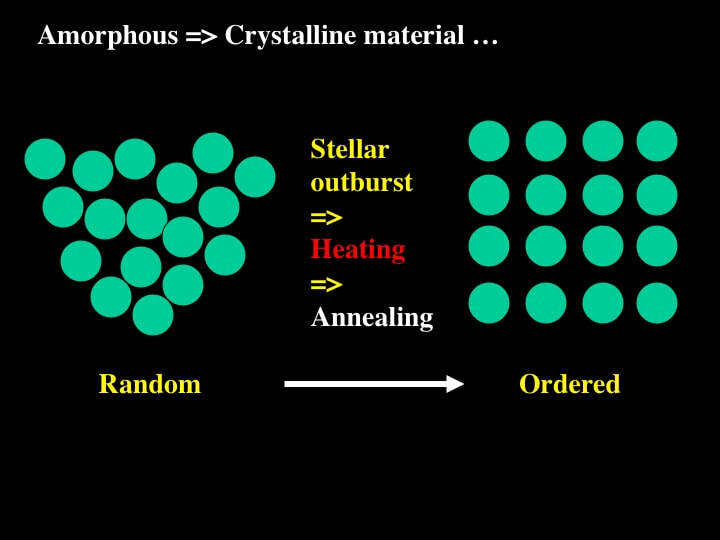 It found two kinds of dust called amorphous and crystalline, and it’s the crystalline dust that created the headaches. 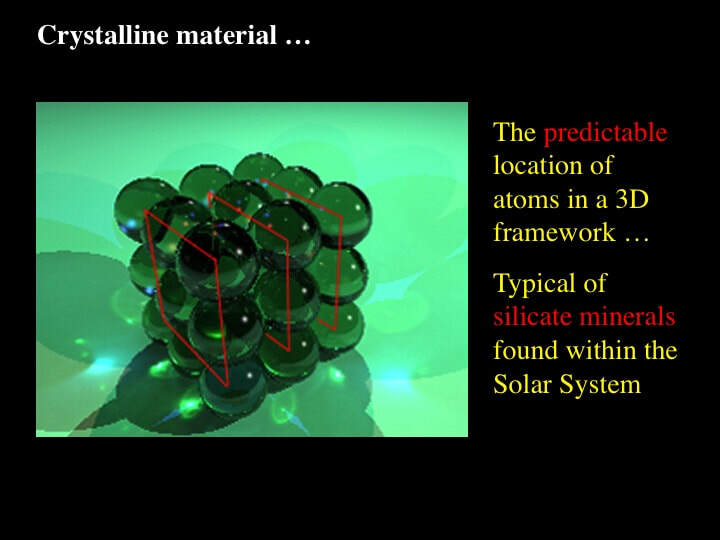 In crystalline materials atoms are neatly aligned along planes in 3D space with a predictable regularity, which when you extend this to macroscopic (visible) scales is why they form reproducible and diagnostic crystal shapes. This is typical of silicate minerals such as olivine, pyroxene, feldspar and quartz that are common in the Rocky Planets, in asteroids and in meteorites throughout the Solar System. 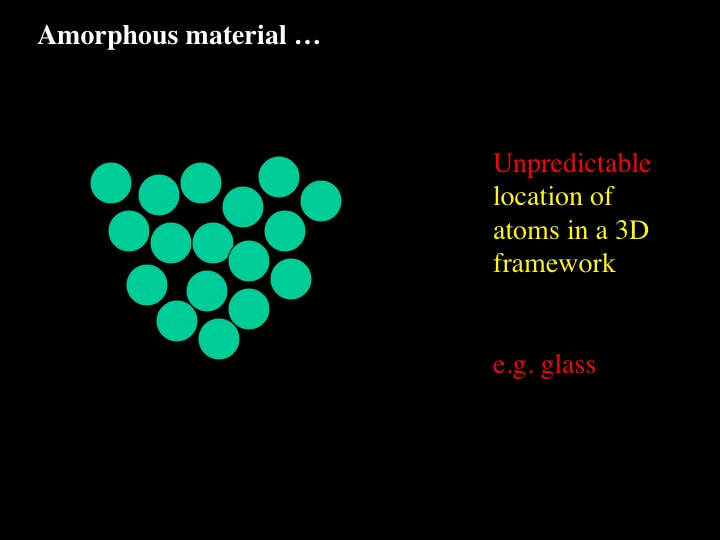 On the other hand, amorphous materials have a random atomic structure; in other words there is no internal order … hence they do not form crystals at the macroscopic (visible) scale. This is what “amorphous” means – without form. The commonest example of this is glass – which in reality is a frozen liquid. Stars eject enormous quantities of dust, including silicate dust, especially when they puff off their outer layers as planetary nebulae - or when they explode as supernovae. Although these stellar dust grains initially form as crystalline materials with a well ordered internal atomic structure, they hang around in inter-stellar space for quite a while before getting caught up in a second cycle of star formation, such as the events that formed our Solar System ~4.6 billion years ago. 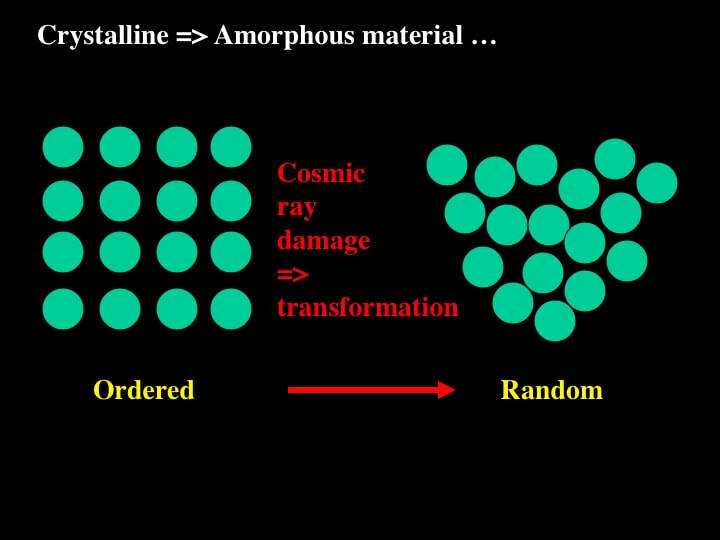 The problem for crystalline dust in inter-stellar space is that it's exposed to bombardment by enormous numbers of subatomic fragments called “cosmic rays” – which are not “rays” at all - that disrupt and randomise the well ordered atomic structure of crystalline materials. The resulting internal structure of these tiny grains of dust is “amorphous”, and this is the kind of dust that ends up in a Solar Nebula from which a Solar System - such as ours - eventually forms. So where does the crystalline dust in comets in our Solar System come from ? The latest idea comes from the recent observation of stellar outbursts in a young star surrounded by an accretionary disk of gas and dust that resembles the early Solar System. The outbursts are explosive episodes that occur during periods of increased rates of accretion of material onto the central star, which give rise to short bursts of heat in the inner part of the accretionary disk – with temperatures rising temporarily to over 750°C. By analysing the infra-red spectrum of the accretionary disk scientists have shown that a strong short-term increase in the presence of crystalline dust grains in the inner part of the accretionary disk coincides with the latest stellar outburst. So here’s the problem. 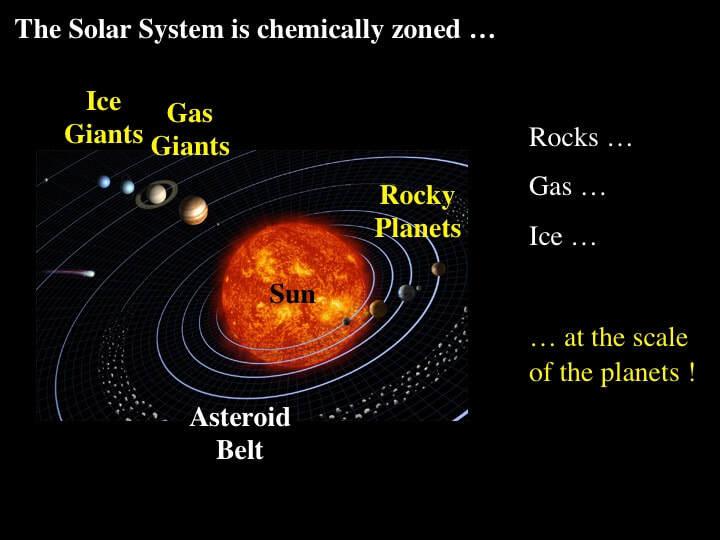 We also know that the Solar System is chemically zoned. 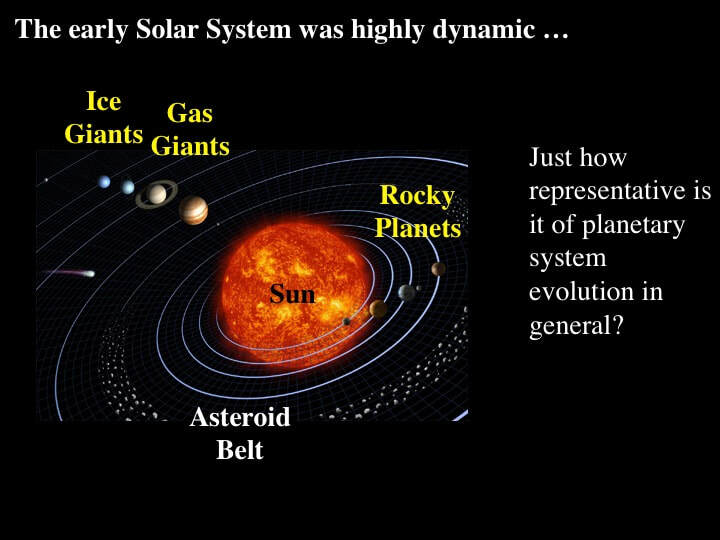 This is obvious by simply looking at the distribution of the planets : Rocky, Gas and Ice outward from the Sun. 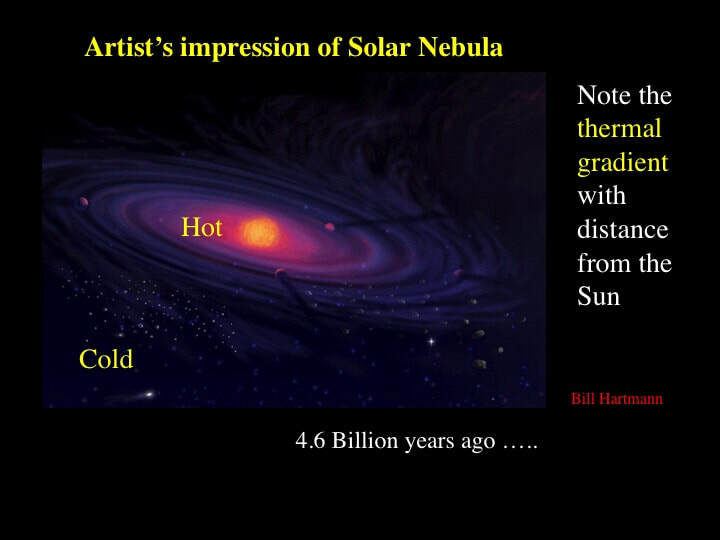 The planets that formed near the Sun are still near the Sun – and those that formed further away are still further away. So the problem is “how do you mix interplanetary dust, but not the planets themselves ?”. The only reasonable solution is that the dust components of the early Solar System were thoroughly stirred up, such that crystalline dust from the inner Solar System mixed with ice and amorphous dust located in the outermost reaches of the Solar System. However, if you’re going to propose mechanically mixing the Solar Nebula, this is a huge piece of real estate to be messing with. The outermost parts of the Solar System where comets formed and still hang out with “dwarf planets” – the Kuiper Belt and the Oort Cloud – reach between a quarter and halfway, respectively, to the nearest star. We’re principally concerned here with the Kuiper Belt because it is a lateral extension of the accretionary disk of our Solar System, but the Oort Cloud contains comets too, so it can’t be ignored. When we discussed this issue 2 years ago I suggested - very simplistically - that the mixing of Solar System materials was size dependent. You may remember this: think of a 4 cars, two 16 wheelers and 2 buses lined up on a bridge in a dust storm. The dust will get stirred and mixed but the vehicles will not change place. However, this begged the question : “what was the process that mixed the fine grained dust in the first place ?”. 2 years ago I had to admit that we had no answer, but in the same issue of Nature mentioned above - someone finally has a plausible theory. 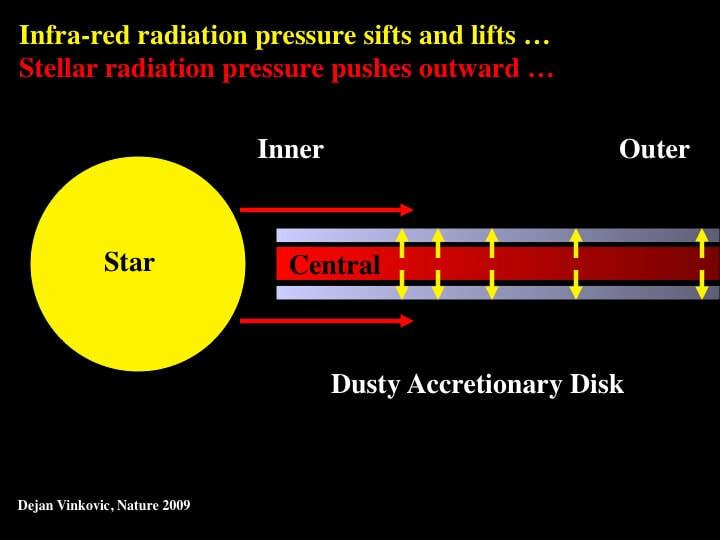 The fundamental problem is that radiation pressure from the central star is too weak to push crystalline dust from the inner part of the accretionary disk to the outer part where comets form - if it has to do so through the traffic jam represented by the central part of the accretionary disk itself. Remember, ~4.6 billion years ago the space between the actively accreting planetary bodies was not as we see it today : it was jam packed with gas and dust ! Planetary scientists have come up with several ingenious ways to get round this – including turbulence, magnetically induced winds and complicated spiral geometries all within the accretionary disk - but they all have problems. The latest model is elegantly simple. It proposes that infrared radiation (heat) from the dust in the central core of the accretionary disk (red) lifts crystalline dust grains of a certain size to the outer surfaces of the disk (lilac), where the weak stellar radiation pressure can more easily push them to the outer part of the disk - cos there’s less “stuff” in the way. This sifting and lifting is strongest in the inner part of the accretionary disk and decreases outward along the thermal gradient, which explains why the crystalline dust grains eventually drop back into the disk where they mix with the rest of the stuff that goes to build comets. The end result is comets that form in the cold outer Solar System and incorporate both amorphous inter-stellar dust and crystalline dust from the transiently super-heated inner parts of the primeval accretionary disk. ​In another Nature article published this summer, planetary scientists took a new look at the main asteroid belt, which sits between Mars and Jupiter. The main asteroid belt has raised fundamental questions regarding the origin of the Solar System ever since it was first identified. Some asked if it was populated by the remains of a shattered mature rocky planet, while others wondered if it was made of primitive material that never got its act together to make a planet in the first place. It turns out that it contains both mature and primitive material, and that the primitive material is indistinguishable from dead comets. This raises the following fundamental question : “what’s all this comet-type material doing in the middle reaches of the Solar System” – given that comets formed in the outer Solar System ? 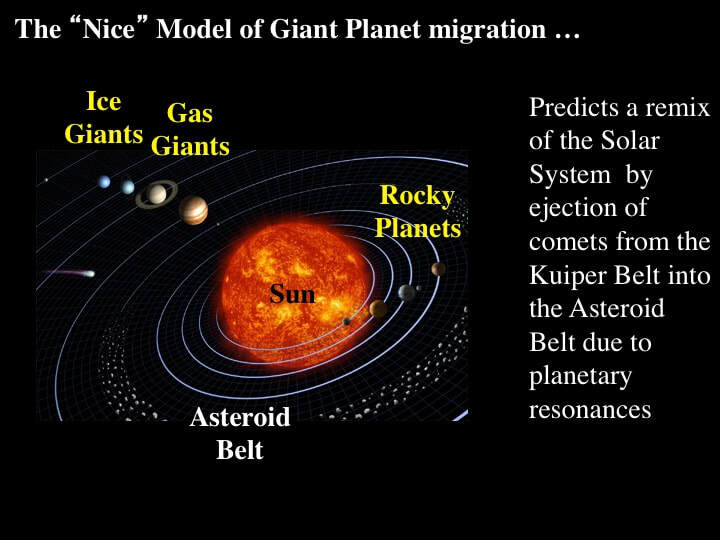 It’s now well established that a computer model of the Solar System - the “Nice model” - predicts that at about ~4.0 billion years ago the Giant Gas Planets (Jupiter and Saturn) migrated inward towards the Sun, while the Giant Ice Planets (Neptune and Uranus) migrated outwards toward the Kuiper Belt. This is what gave rise to the Late Heavy Bombardment that came to an end at about 3.8 billion years ago. Gravitational effects due to Uranus and Neptune - known as “resonances” - destabilised the orbits of dwarf planets and cometary objects in the Kuiper Belt and either ejected them out of the Solar System or channeled them inward toward the Sun . Some left their mark in the major impact features that decorate the face of our Moon, while others were shepherded by “resonances” with Jupiter and Saturn into the Main Asteroid Belt, where they joined debris left over from Rocky Planet formation in the inner Solar System. So, the textbook picture of our Solar System as a collection of stable orbits - chemically zoned from its warm interior to its cold exterior - is way too simplistic. Our Solar System has evolved dynamically – initially ejecting dust from its interior to its exterior where it mixed with material derived from interstellar space – followed 700 million years later by planetary migration that hurled outer Solar System material back into the inner Solar System, where some of it took up residence in the Main Asteroid Belt. With all this mixing and migration, it’s a wonder that our Solar System is as stable as it is. In addition, the models proposed to explain this dynamism require systematic and gradual changes – which are nothing short of miraculous ! Hence, it’s not unreasonable to ask just how representative our currently harmonious Solar System really is of planetary systems elsewhere in our galaxy.